Based upon the number of responses it elicited there clearly was no shortage of interest in Part One of this series. I can understand why. Many annuity agents have been thrust into something of a netherworld by events largely beyond their control. Annuity agents are experiencing a continuing disruption of their traditional sales practices that began with the issuance of NASD (FINRA) NTM 05-50. For agents it can seem as though everything they once viewed as stable has come under assault including their public image, the products they sell, the advice they provide, the seminars they use, not to mention the comparatively lax suitability and compliance standards from the recent past. It’s no wonder that many agents wish for a quick and easy end to the pain. But pain relief comes at a cost than can be significant. Scare tactics are clearly not out-of-bounds when used by those pitching annuity agents on the Registered Investment Advisor “answer.” “REAP THE REWARDS OF INDEXED ANNUITY SALES WITHOUT THE FEAR” is a prominent theme of the “pitch.” But is becoming a fiduciary advisor really the answer? In Part One of this series I argued that the RIA option may not prove viable for many annuity agents. The reason is that for the RIA transition to be successful, an annuity agent must be willing to undergo a radical transformation in terms of allegiance (in both a practical and strict legal sense) and in the manner in which he or she is compensated. How many will sign-up to undergo such a dramatic transformation? It was advertising directed to annuity agents that I characterize as exploitive that first got me interested in this subject back in April. I saw print and video advertising designed to convey both overt and covert messages. The thrust of the advertising- the “pitch”, if you will- seemed to convey that it’s possible for annuity agents to retain their customary sales and marketing strategies and compensation model while also operating as a Registered Investment Advisor. This assertion was and is the “rub” as far as I’m concerned. I’m all for swelling the ranks of RIAs. However, I also believe it is grossly unfair to lead annuity agents to conclude that they can continue to legally represent the best interests of insurance companies, continue to rely upon rich, first-year compensation, and, act as a fiduciary all within the framework of a single client relationship. Why Do the Ads Neglect to Mention the Heightened Responsibilities Fiduciaries Assume? Why is there is no mention of fiduciary responsibility in the ads for the “pitch?” Or, for that matter, any mention of the “rewards” for consumers? Is it because the purveyors of the “pitch” believe it is possible for an individual to act as an indexed annuity agent and a fiduciary at the same time with the same client? Or, is it that they simply prefer to avoid mention of the substantial and complex responsibilities that come with acting as a fiduciary advisor? In Part One I attempted to demonstrate through the comments of experts including experienced RIAs that the “pitch” is dangerous if not bogus. Attempting to induce annuity agents to believe that they can easily side-step broker-dealer compliance is a disservice to the very people the proponents of this approach claim they are serving. So let’s now examine what can happen when an individual producer seeks to operate as both a traditional annuity agents and a Registered Investment Advisor at the same time. Do RIAs Receive Extra Protection? Can $2,000,000 in Indexed Annuity Commissions Get You Noticed? 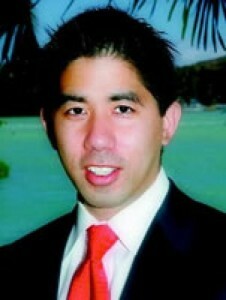 Meet Mark K. Teruya, president of USA Wealth Management L.L.C. Mark Teruya’s story seems to be a sad one. I don’t know him but I’d bet he is a decent person who is liked by his clients. I doubt that Mr. Teruya ever imagined he’s be in all kinds of trouble. He is by all accounts in a great deal of trouble. He is also a registered investment advisor based in Honolulu, Hawaii. Judging by some of his published articles Mr. Teruya was a very effective marketer. He wrote numerous articles for newspapers in Hawaii that were focused on providing pro-consumer financial advice. As an example, click here to read one of his articles in which he blasts high mutual fund expenses. I suspect that authoring such articles was integral to his overall annuity marketing strategy, i.e. cultivate a well known and strong pro-consumer identity in order to create a favorable prospecting and selling dynamic. This is not an unusual marketing strategy for annuity agents to pursue. Both state and federal regulators have accused Teruya and his firm of using breakfast and dinner seminars to attract retirees, then arranging for one-on-one follow-up meetings. What? Did you hear that? 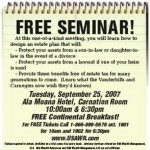 Using seminars to attract retirees? And make appointments with them? I don’t know whether to laugh or weep. These are usual and customary marketing tactics have been a relied upon by thousands of successful annuity producers. If you don’t know what “disgorgement” means it refers to the repayment of ill-gotten gains that is imposed on wrong-doers. Teruya may be forced to refund the $2,000,000 in commissions he earned- plus interest… and also be forced to pay substantial penalties, to boot. I hope he’s been a good saver. Just reading the headlines tells you that it’s simply not viable for an annuity agent to observe traditional sales practices while acting as a fiduciary advisor. Could it be more plain? Teruya committed fraud, …”when he failed to disclose that he was an insurance agent in a position to collect large commissions on the purchase of EIAs.” the complaint said. The annuity industry has been far too slow in utilizing digital content and web-based communications strategies to help its agents reach more annuity prospects in a compliant manner. The price for this delay is being paid on a daily basis. For example, we’ve observed the fallout from agents and IMOs placing non-compliant presentations on the Internet (for more see my article in the September issue of Broker World magazine called “Dangerous Trends In Annuity Marketing Put Industry And Brokers In Jeopardy“). I know this particular article resonated with many annuity agents based upon the number of phone calls I’ve received from agents since its publication. Teruya is accused of fraud by the SEC. Teruya’s SEC charges make the front page in the same newspaper he previously his columns had previously appeared. Major newspapers across the U.S, produce stories about the SEC action and, or, Teruya. One example: In Tampa, Florida both major papers produce front page, non-syndicated, locally authored articles discussing seminar abuse. The “pitch” says to annuity agents that they can seek shelter under the umbrella of RIA status. Don’t believe it. It didn’t shelter Mark Teruya. I’d bet money that he is now facing penalties that are far more severe than what the state insurance department might have sought. And he is facing these harsher penalties precisely because he is a registered investment advisor. The fallen reputation of indexed annuities is a tragedy of grand scale. The underlying value proposition indexed annuities provide- safety of principal combined with upside growth potential- is not only legitimate it is vital to millions of Americans as they approach retirement and enter the Transition Management phase. Unfortunately, what has played out over the past decade, “The Process” – in which the activities of good and decent people leads to sub-par results- has zapped the industry of its vitality at a critical moment. Rome really is burning. And lots and lots of very decent people are being hurt. Not too many years ago it was an accepted belief that seniors were the most qualified purchasers of deferred annuities. Now it is generally believed that seniors require protection from deferred annuities. It’s not difficult to imagine business school students in the future studying the disastrous decline in public perception of an important industry as an example of how not to conduct business. This sad state of affairs will not be repaired until fundamental reform occurs, technology comes to the forefront and the focus on consumers’ best interests becomes everyone’s top priority. Apologies to OppenheimerFunds’ Kathleen Beichert, Chair of RIIA’s Research Committee as well as to RIIA’s research partners, Elvin Turner of Turner Consulting, and Larry Cohen of SRI-BI. Also, my sincere apology to JordenBurt’s Joan Boros. A cut/past error earlier caused the contributions of these individuals at RIIA’s Annual Meeting to not be mentioned in yesterday’s article (I create these articles in Word and them past them into the blog application). Please see the section I’ve added in the text below. On Monday of this week the Retirement Income Industry Association (RIIA) held its Annual Meeting and Awards Dinner. Over the course of a long but stimulating series of presentations attendees were left with a vivid sense of the unique value RIIA brings to the retirement income industry. Where else does the cross-silo retirement income conversation take place? RIIA’s Founding Chairman, Francois Gadenne, kicked-off the day with a presentation summarizing RIIA’s mission and goals including a report card on the substantial progress that has been made in achieving them. The various morning sessions offered specific insights into the important work being undertaken by RIIA’s various committees. Laura DeFraia (Wachovia), Laura Varas (Financial Research Corporation) and Elmer Rich (Rich & Co.) highlighted results from RIIA’s Employment Survey. Rick Nersesian, formerly Director of Retirement Income at UBS and now a private consultant, discussed ongoing efforts to expand RIIA’s membership ranks. Royal Bank of Canada’s Ron DeCiccio, Chair of RIIA’s Education Committee, was joined by Retirement Learning Center’s John Carl, in a presentation about the expansion the curriculum that will lead to the awarding of the professional designation, RIIA Retirement Income Expert (RIE). Kathleen Beichert, Chair of RIIA’s Research Committee, invited Elvin Turner and Larry Cohen to describe RIIA’s latest research efforts. Larry and Elvin delivered a concise overview of RIIA’s next research report addressing, in part, the number of financial relationships consumers in different market segments maintain and the implications arising out of a shrinking of that number as retirement draws near. Like, the first research report in this series, the new report will provide completely new insights. Russell Investment Group’s Richard Fullmer, Chair of RIIA’s Methodologies Committee, introduced RIIA’s Statement of Principles. These principles govern software used to illustrate retirement income projections. Larry and Elvin delivered a concise overview of RIIA’s next research report addressing, in part, the number of financial relationships consumers in different market segments maintain and the implications arising out of a shrinking of that number as retirement draws near. Like, the first research report his series, the new report will provide completely new insights. Next, Joan Boros of JordenBurt LLP delivered a presentation on the organization of RIIA’s Compliance Committee including an overview of the Committee’s goals and future value to RIIA members. Matthew Greenwald (Matthew Greenwald & Associates) delivered the lunchtime Keynote address entitled, “The Inevitable Grassroots Change”. Greenwald presented a moving and candid analysis of US retirement security in the context of real life examples. In the afternoon it was my privilege to Chair RIIA’s Communications Conference. I began with remarks detailing the reasons why I believe that, for retirement income businesses, success is synonymous with excellence in communications. The program then shifted to multiple presentations from elite financial advisors – “Income Pioneers”- who have already made a successful transition to income generation oriented practices. Phil Lubinski, CFP® and Briggs Matsko, CFP®, demonstrated their communications techniques and financial strategies for income generation. Rick Miller, Ph.D., CFP®, talked about the impact of technology on fiduciary advisors and nimble product providers. Harold Evensky, CFP, ®, summarized how financial advisors should be preparing to meet the retirement income needs of the Boomer generation. Evensky provided helpful glimpses into the strategies he has used to manage clients’ expectations across volatile market conditions. The financial advisors’ presentations were enormously insightful and really drove home the point that the genius of successful advisors is due, in part, to their genius as effective communicators. I concluded the Communications Conference with the observation that Lubinski, Matsko, Miller and Evensky are members of an elite minority of advisors, and that the real challenge for the industry will be in introducing the educational tools and communications technologies needed by the 95% of advisors who have yet to acquire equal income planning skills. The next part of the program was the presentation by Research Magazine Editor, Gil Weinreich, of RIIA’s Lifetime Achievement Award to Professor Zvi Bodie of Boston University. Bodie is the Norman and Adele Barron Professor of Management at BU. He was selected for the award for his many achievements in applied research. Bodie holds a Ph.D. from the Massachusetts Institute of Technology and has served on the finance faculty at the Harvard Business School and MIT’s Sloan School of Management. Professor Bodie’s textbook, Investments, is the market leader and is used in the certification programs of the Financial Planning Association and the Society of Actuaries. His textbook Finance is coauthored by Nobel Prize winning economist, Robert C. Merton. Professor Bodie’s latest book is Worry Free Investing: A Safe Approach to Achieving Your Lifetime Financial Goals. Prior to the RIIA Excellence in Communications Awards Dinner there was a cocktail hour which included a book signing opportunity with two noted authors, Terry Burnham (Mean Markets & Lizard Brains) and Harold Evensky (Retirement Income Redesigned). The Keynote Address was presented by Professor Bodie. His talk, entitled “Encouraging Adaptation” was funny, motivating and highly insightful. Bodie has a unique capacity to both simplify complex issues and pummel conventional wisdom. For instance, I’d bet money that his comments on Target Date mutual funds caused many audience members to re-examine their views on these popular investment vehicles. After Professor Bodie’s address it was time to present the RIIA Excellence in Communications Awards in the categories of Best Advertising Award, Best Retail Communications Award and Best DC Communications Award. RIIA’s media sponsors selected the various award winners from the many entries submitted. Armee Lee chaired the Investment Wires Committee that selected Nationwide Financial as the winner for its “Life Comes at You Fast” campaign. AXA was runner-up for its “800-pound Gorilla” campaign. Evan Cooper of InvestmentNews presented the Retirement Income Communications Award in the New Media category to Morningstar for its Retirement Income presentation, part of Pincipia Presentations & Education module. Runner-up went to Jackson-National Life for the “But What if I Live” DVD presentation. Allison Cooke of Sponsor of PLANSPONSOR presented the DC Advisor Award to Genworth Financial for its “ClearCourse Personalized URLs.” Receiving the runner-up award was Pacific Life for its “Destination Independence” piece. Francois Gadenne closed out the eventful day with a gracious thank you to all that participated. In thinking about the RIIA event I feel that attendees gained tangible value, and that RIIA may have exceeded the expectations of some. Important insights emerged that could only have come out of a meeting where multiple silos across multiple industries are brought together in a single conversation. That’s both unique in the retirement income industry and very much needed. Since the formation of the Retirement Income Industry Association (RIIA) a number of initiatives of genuine importance to its members have been launched. One of the most important is an effort to develop sound principles for the creation of industry-wide standards for the development of retirement income calculators, tools and illustrations that promote various retirement income products and strategies. On August 10 RIIA issued a press release on this subject but the effort is deserving of additional attention. Led my Russell Investment Group’s, Richard Fullmer, CFA, RIIA’s Methodologies Committee has crafted and introduced a Statement of Principles to provide needed guidance in this critical area. Other members of the Methodologies Committee that assisted in the development of the Statement of Principles include Moshe Milevsky (IFID Centre), Anna Abaimova (IFID Centre), Peng Chen (Ibbotson Associates), Ben Williams (Retirement Engineering, Inc.), Phil Edwards (Standard & Poors), Pirooz Vakili (Boston University), Kazi Ariff (Bank of America), Kim McSheridan (Symetra Financial), Lowell Aronoff (Cannex Financial Exchanges), Bob Padgette (Klein Decisions) and Thomas Idzorek (Ibbotson Associates). The Methodoligies Committee will deliver a presentation on its work at the upcoming RIIA Annual Meeting and Awards Dinner to be held in Cambridge, Massachusetts on September 16-17, 2007.
necessary for retirement income planning and promotions. The Principles seek to promote the use of clear and effective modeling techniques, explanation and communications through complete disclosure of assumptions and the use of consistent terminology. To view the Statement of Principles, go to www.riiausa.org. A set of guidelines to these Principles which will provide guidance on meeting the RIIA standards. A set of “calibration points” by which model developers can compare their assumptions and results against. “As the baby boomers march into retirement, their shift from focusing on accumulating retirement savings to creating a secure retirement income makes consistency, clarity and understanding of income modeling more urgent that ever,” contends Francois Gadenne, Founding Chairman of RIIA and CEO of Retirement Engineering, Inc. “RIIA is an organization that succeeds because of its members’ active leadership and participation. The members of our Methodologies Committee felt strongly that RIIA take responsibility for improving projection models because a failure to do so is a disservice to both the retirement income industry and the clients we serve. It is gratifying to see the early results of their important work,” says Gadenne. A full report on the Statement of Principles as well as updates from the other RIIA Committees will be provided at the upcoming RIIA Annual Meeting and Awards Dinner on September 17, 2007 at the Royal Sonesta Hotel Boston in Cambridge, MA. To learn more or register for the event, please go to www.riia-usa.org. Earlier this year I published an essay on the burgeoning effort to recruit annuity agents into the ranks of Registered Investment Advisors. While I haven’t written about this issue since that time I’ve thought about it a great deal. So have a lot of other people including some who see an opportunity to create lucrative new businesses by disrupting independent agent distribution. I’m all for free enterprise. But I’m opposed to initiatives that may seek to exploit agents who are frustrated by challenges they didn’t’ ask for or expect. Today’s article is the first in a series devoted to the agent-to-RIA conversion “pitch.” The more I delve into this the more concerned I become. One of my goals with this series is to help protect annuity agents by providing them a balanced perspective on the RIA option. It’s my hope that a thorough understanding of the risks and potential rewards will lead to good decision-making. Back in April I expressed caution about the pitch to annuity agents that urges them to become registered investment advisors. My early caution has crystallized into a strong belief that for most annuity agents the RIA option is, well, unsuitable. Opting to become an RIA may be a viable course of action for annuity agents willing to submit to a truly extreme makeover in terms of their stated allegiance and compensation model. How many agents will be willing to drink the fiduciary cocktail and take on the related responsibilities that come with observing a fiduciary duty once they understand all of its ingredients? What’s in the Fiduciary Cocktail? The very last sentence, “A fiduciary cannot have a conflict of interest” would seem to crystallize the key challenge: how can an individual simultaneously act as a fiduciary and an agent for an insurance company within the framework of a single client relationship? The website for Miller’s firm, Sensible Financial Planning, states: “We accept no commissions or any other payments from any financial product or service provider. We work only for you.” That description stands in stark contrast to the way annuity agents typically operate. Some annuity agents may not fully understand the legal structure of the “principal-agent relationship” that governs their obligations to the insurance companies they represent. In the same manner that stockholders of a corporation (the principals) hire managers (the agents) to act in their best interests, the insurance company (principal) hires agents to act in its best interests. The fact is, under this relationship framework the primary duty an annuity agent undertakes is to represent the insurer’s interests, not the client’s. Annuity agents who have seen broker-dealers disapprove their relied-upon annuity advertising and sales presentation materials including letters, seminar presentations and display ads, will surely be attracted to the notion of becoming their own compliance officers. But how many annuity agents possess the knowledge and experience to develop compliant advertising in the context of a registered advisory practice? And what of the longer-term consequences following biennial audits of registered investment advisors’ practices including their advertising? Could annuity agents be setting themselves up for an unpleasant future shock? Am I willing to place the interests of my client ahead of my own? Am I willing and able to accept an entirely new method of compensation with the result that my compensation may decrease? And, under what legal framework do I wish to operate? The potential answers to these questions imply an interesting set of trade-offs, opportunities and costs. ©2007 David A. Macchia. Al rights reserved. Summer’s over, September is upon us. That means I have to get back to work on this magazine; lots of interesting topics to be explored, and some fantastic interviews to publish! Tomorrow I’ll publish part one of a multi-part series on the efforts underway to remake annuity agents into Registered Investment Advisors. One of the major industry highlights in September is the Retirement Income Industry Association’s Annual Meeting and Awards Dinner. The Annual Meeting and Awards Dinner provide us an opportunity to meet with a large group of Financial Advisors (FAs), their key membership organizations and their specialized trade magazines to learn, from their perspective, how well the industry is doing during this transition from asset accumulation to income distribution. We expect that attendance will range from 150 to 200. “Do you know how to build a successful retirement income practice while the industry is slowly moving from an accumulation focus and towards a retirement income focus?” It’s an important question that will be answered by an elite group of advisors who have already successfully made the transition to income-generation practices. The structure and content of the conference is meant to attract FAs who are interested in retirement income issues and want to do something practical about it, now. The value of the conference for RIIA’s Regular Members and conference sponsors is that up to 50% of the audience will be FAs and that there will be plenty of time to interact with them. During the morning sessions, the Committees will present the relevance of their work for FAs. In particular, look for key announcements and developments from the Research, Education and Methodologies Committees. During the afternoon sessions, the Communications Conference will focus on the communications needs of FAs during this time of transition. RIIA’s Committees as well as experienced and successful Financial Advisors will present what they have done to address the question and their results to date. Their insights will be valuable to any retirement income organization looking to maximize success. The lunch keynote (Matt Greenwald), afternoon keynote (Harold Evensky), and dinner keynote speaker (Zvi Bodie) are leaders in the field who have relevant messages for FAs. Our Noted Authors (Terry Burnham and Harold Evensky) will sign books that were selected because they have relevant messages for FAs. During the dinner, the RIIA Awards will recognize companies whose work and communications are particularly helpful to FAs during this time of transition. Given the attendees list, much of the value-added will take place during the breaks, dinner, and desert/after-dinner drinks. To register for the Annual Meeting, please visit www.riia-usa.org.